I won this patch in 1973 on the corner of Dunbar and 41st, outside Nitingale Pharmacy, Vancouver, British Columbia. (The pharmacy is long gone; in it's place now is a used bookstore.) One of my fondest childhood memories. The instructor wore a dark navy, waist-length coat with a large National Yo-Yo patch sewn on the breast pocket area. A great guy who put on a jaw-dropping demonstration for us kids. 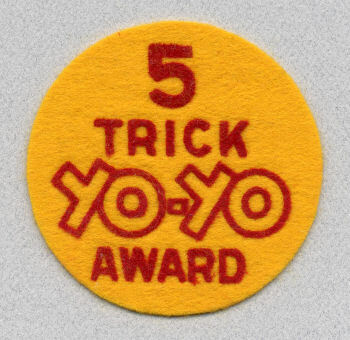 I managed to pull off the necessary tricks to become the "National Yo-Yo champion" in the neighborhood (see the National Yo-Yo Champion shield patch). At that time, National Yo-Yos were the yo-yo brand of choice (all wood, fixed axle), probably because they were a Canadian company, even though the yo-yos were made in Sweden.